Delivering a compelling consumer experience at the ATM is a widely recognised success factor for both financial institutions and independent ATM operators. Renovite’s cloud-native Reno-ATM solution is a comprehensive answer to the innovation challenges posed by aging, inflexible infrastructure and vendor dependencies. for faster time to market, and powerful scripted transaction switching that enriches transaction workflows and rejuvenates legacy infrastructure investments. Renovite has the expertise and solutions to smoothly transform your existing ATM channel to a 21st Century, cloud-native architecture that allows you to exploit new service opportunities, leverage your digital banking investments, and reduce your operational and application lifecycle management costs. Reno-ATMs cloud-native server architecture delivers greater deployment choice, low processing costs, and greater agility when adapting to emerging requirements. ATM Deployers have complete control over the configuration of consumer transaction workflows without vendor limitations or restrictions. The intuitive Consumer Experience Builder tool facilitates rapid configuration and validation of new consumer services without the need for code changes. Reno-ATM is easily integrated with other channels to deliver a seamless and personalised consumer experience across the self-service and digital banking channels. Reno-ATM solutions include robust, automated end-to-end testing ensuring new services can be deployed quickly and with full confidence. Reno-ATM provides centralised fleet management and the targeted distribution of individual components updates resulting in greater service availability and lower risks of service outage. 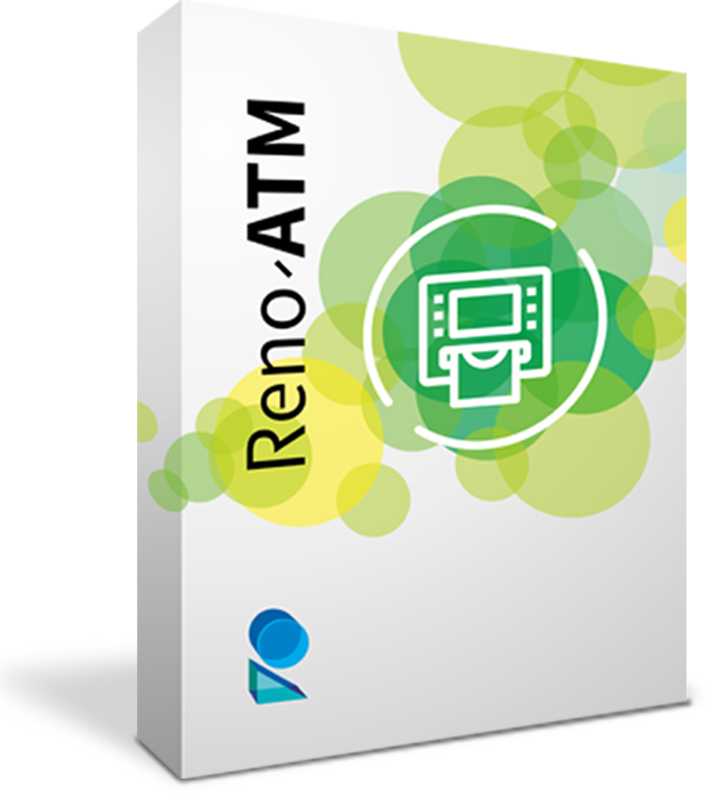 The Reno-ATM client application is operating system agnostic supporting both Windows and Linux deployments. Traditional ATM applications are built around hard-coded business logic with limited configuration capability. By contrast, Reno-ATM gives users complete control over the transaction workflow steps and activities – without any limitations or vendor dependencies. The consumer screens are created using standard HTML 5 technologies and are completely separated from the transaction workflows. This important feature ensures that screens are easily created and maintained without impacting the transaction workflows resulting in lower maintenance costs and greater service reliability. The Reno-ATM application is operating system agnostic and is available for Windows XP / 7 / 10 and Linux providing ATM Deployers greater freedom in their choice of self-service terminals. Reno-ATM’s Server uses in-memory data grid technology to ensure rapid access to static configuration data and dynamic transaction data. The ability to make dynamic configuration changes without any down time or disruption to business services means that operators can take immediate and action in response to changing needs. Reno-ATM is easily integrated with your existing ATM monitoring and cash management tools allowing you to protect your existing investments and enabling your operational teams to leverage their existing experience and business processes. Additionally Reno-ATM is easily integrated with various financial services systems to provide a more seamless self-service banking experience for the consumer that delivers account and payment services alongside the traditional cash-centric services. Stimulating new Business Innovations is greatly enhanced by a cost-effective way to validate consumer reaction to new services. This kind of nimble Commercial R&D is simply unthinkable using legacy platforms due to the excessive costs and risks involved. However, a cloud-centric sandbox approach makes all the difference, delivering a fast, affordable, and safe way to evaluate new business services and enhancements. The Consumer Experience Builder provides ATM deployers with full control over the consumer services, including screen branding, the menu navigation, and transactional services. The unique integration between the Consumer Experience Builder and the Reno-ATM client enables new configurations to be rapidly validated from the desktop, using virtual ATMs, or physical ATMs. This results in a faster time to market and greater confidence when deploying new services. Pooled ATMs are easily accommodated using the built-in branding options and the system is easily extended to leverage additional CRM information for the personalisation of consumer services. The Reno-ATM client and server components provide an integrated management environment to oversee all aspects of the ATM services. This includes the installation of the consumer experience configurations, the supervisor panel for device management, the operational management functions and the associated cash management services. Implementing new ATM services in legacy switching platforms can be overly costly and complex. The deployment of Reno-Switch to augment, or replace, legacy switching infrastructure ensures that new ATM transactions can be easily processed. Unique transaction workflows are easily deployed for different transaction types - including the routing of transactions to multiple endpoints. Our Reno-Test product is easily deployed to provide a robust, automated end-to-end testing of all ATM operations and transaction flows from consumer interactions right through to the back end host processing. Full test of all screens, APIs, messages, and log files is easily accomplished with Reno-Test’s intuitive scripting language. Integration with the Cashware ATMirage ATM test tools is available as standard and other ATM test tools can be integrated as required.